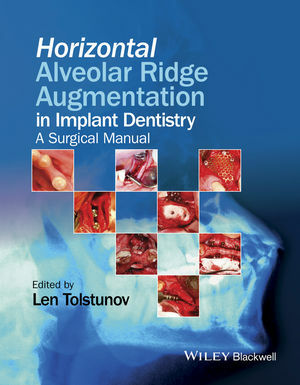 Horizontal Augmentation of the Alveolar Ridge in Implant Dentistry: A Surgical Manual presents the four main methods of horizontal ridge augmentation in a clinically focused surgical manual. After an introductory section and requirements for dental implants, sections are devoted to each procedure: ridge-split, intraoral onlay block bone grafting, guided bone regeneration, and horizontal distraction osteogenesis. Len Tolstunov, DDS, DMD, is a Diplomate of the American Board of Oral and Maxillofacial Surgery, the American Board of Oral Implantology/Implant Dentistry, and the International Congress of Oral Implantologists. He is Assistant Clinical Professor in the Department of Oral and Maxillofacial Surgery at both the University of the Pacific and the University of California, San Francisco. He has published more than 30 articles in peer-reviewed journals and has lectured nationally and internationally on bone grafting, ridge-split procedure, and other implant dentistry and oral surgery topics. In addition to his responsibilities teaching at the two dental schools in San Francisco, he also maintains a full-time private practice in oral and maxillofacial surgery. To know more about Dr. Tolstunov, visit www.SForalsurgeon.com. Joseph A. Leonetti and J. Daulton Keith, Jr.